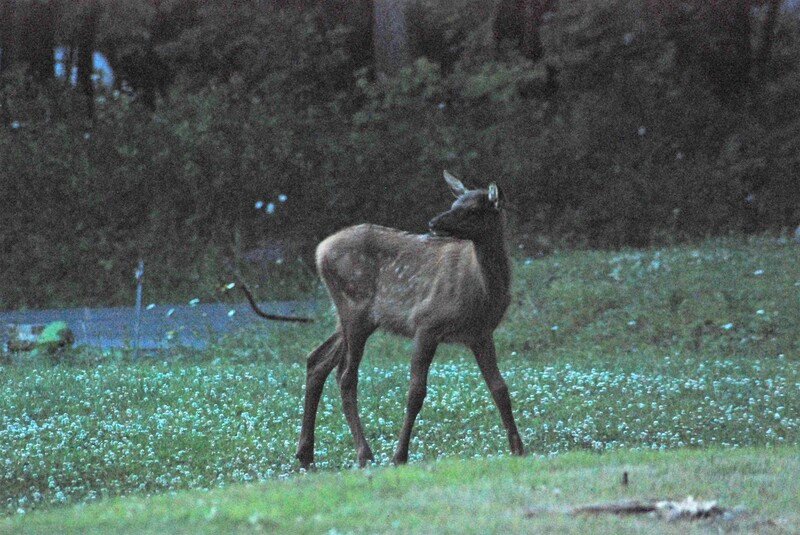 I will never forget the first time I heard an elk bugle. It was below the Winslow Hill Viewing Area, and the cry cut through the eerie, early morning fog, a hauntingly beautiful sound like none that I have ever heard before. 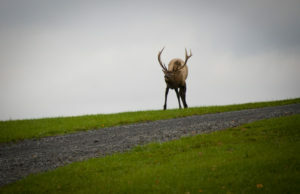 Benezette and the surrounding areas are PACKED with people hoping to hear the elk bugle during the rut. As explained by the Rocky Mountain Elk Foundation (RMEF), when August draws to a close, a bull’s antlers are fully grown, and ready for the display and fighting that comes with their mating season, known as “rut.” Larger bulls tend to have a louder bugle than their more youthful rivals, this is an important indicator of size and strength not only for cows in search of a mate, but also potential rival bulls. A bugle can also indicate acceptance or the challenge to engage in a fight with another bull. A show of strength, bulls typically do not get injured, though this may occur. One common misconception that we hear from tenants over and over is that you can only see elk in Pennsylvania during the rut. NOT TRUE!!!!!! Not only can these majestic creatures be seen at ANY time during the year, there are several reasons why visiting in the “off-season” can be more fun! This is a no-brainer! If you have ever been stuck in an elk-induced traffic jam on Winslow Hill, you know EXACTLY what I am talking about. Though the PA Elk Range is estimated to cover land from Coudersport to Clearfield (see RMEF map below), the majority of the tourism is conducted in and around Benezette, which isn’t a very big town! So skip the traffic and lines at the local restaurants! Don’t get me wrong, elk are WILD ANIMALS and should not be approached, nor should you try to touch or feed them!!! 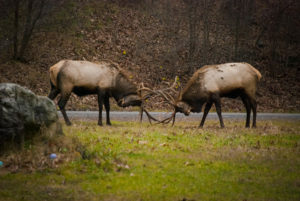 During the rut, bulls are considerably more aggressive in trying to protect their harems (groups of cows) from other males, according to the RMEF. Benezette boasts an elk population that is rather tolerant of humans and they will often let you get close. 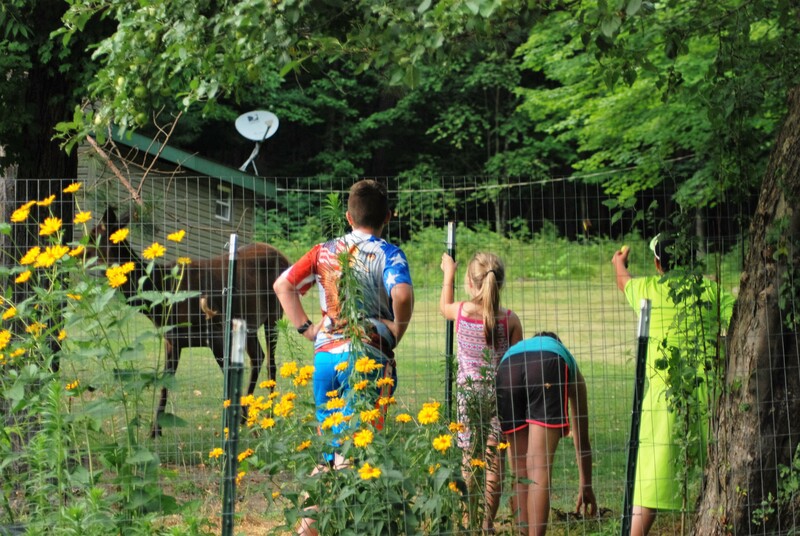 This past weekend, our kids and their friends climbed in a fenced perennial bed at The Elk Grove for an up close and personal look at a local cow interested in the apple tree. 3. 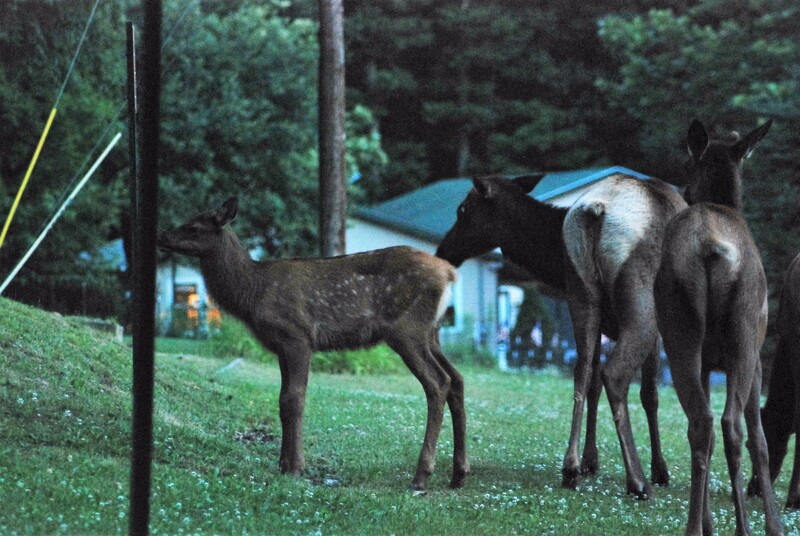 Baby Elk… Need I say More? 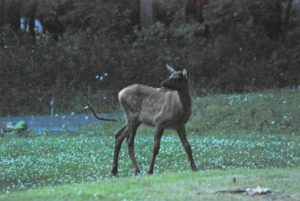 I shot these photos at dusk this past weekend, who WOULDN’T want to see a baby elk who still has its spots??? Shed (dropped antlers) hunting is pretty much the unofficial spring sport of Elk Country. According to the RMEF, antlers grow throughout the year as layer upon layer of cartelige gradually develops into solid bone by the start of rut. As testosterone levels start to taper off, by spring, bulls are ready to lose their antlers. As the sheds drop, people follow. I have yet to find an elk shed, but I can say that I have logged a good amount of miles on foot (and snowshoe) in search of the prize! For a very cool shed hunting success story, see this forum post from pahunting.com! 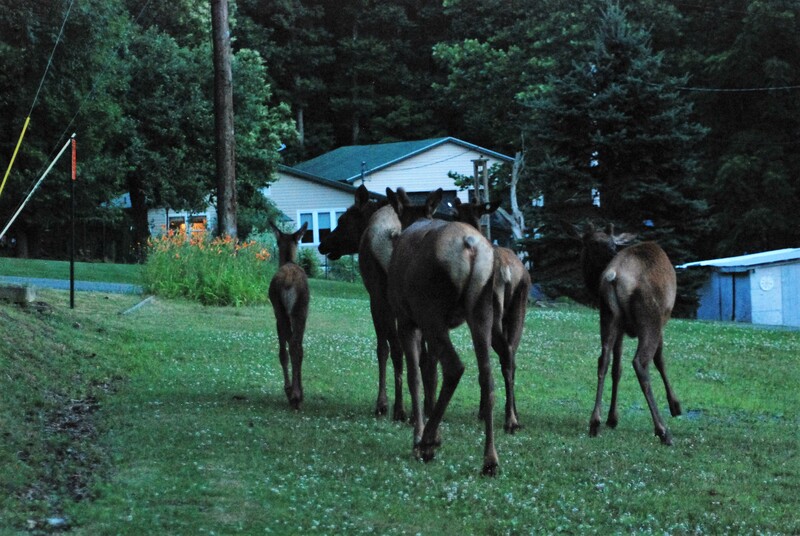 Elk viewing is just ONE of the amazing parts of the Pennsylvania Wilds! 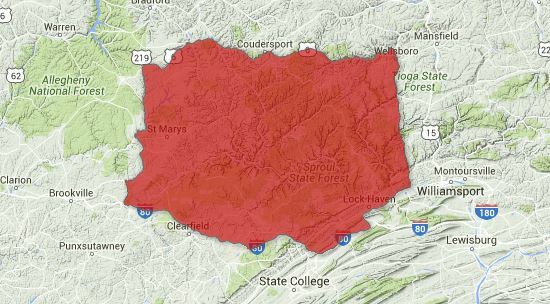 Elk State Forest covers 200,000 acres that is part of Pennsylvania’s extensive 2.2 MILLION acre system of state forest. We have hiking, camping, hunting trapping, fishing, mountain biking, horseback riding, kayaking and canoeing, and winter activities such as cross-country skiing and snowmobiling. For an excellent resource about what to do in and around Elk Country, see the Pennsylvania Great Outdoors Visitor’s Bureau’s website here.